This first gram of yellowcake was produced from uranium captured from seawater with modified yarn. Chien Wai and colleagues at LCW Supercritical Technologies produced the yellowcake, a powdered form of uranium used to produce fuel for nuclear power production. Material designed to capture uranium from seawater as an alternative to land-based mining of the fuel for nuclear power production is tested at PNNL's Marine Sciences Laboratory. SEQUIM, Wash. — For the first time, researchers at Pacific Northwest National Laboratory and LCW Supercritical Technologies have created five grams of yellowcake — a powdered form of uranium used to produce fuel for nuclear power production — using acrylic fibers to extract it from seawater. "This is a significant milestone," said Gary Gill, a researcher at PNNL, a Department of Energy national laboratory, and the only one with a marine research facility, located in Sequim, Wash. "It indicates that this approach can eventually provide commercially attractive nuclear fuel derived from the oceans — the largest source of uranium on earth." That's where LCW, a Moscow, Idaho clean energy company comes in. LCW with early support from PNNL through DOE's Office of Nuclear Energy, developed an acrylic fiber which attracts and holds on to dissolved uranium naturally present in ocean water. "We have chemically modified regular, inexpensive yarn, to convert it into an adsorbent which is selective for uranium, efficient and reusable," said Chien Wai, president of LCW Supercritical Technologies. "PNNL's capabilities in evaluating and testing the material, have been invaluable in moving this technology forward." 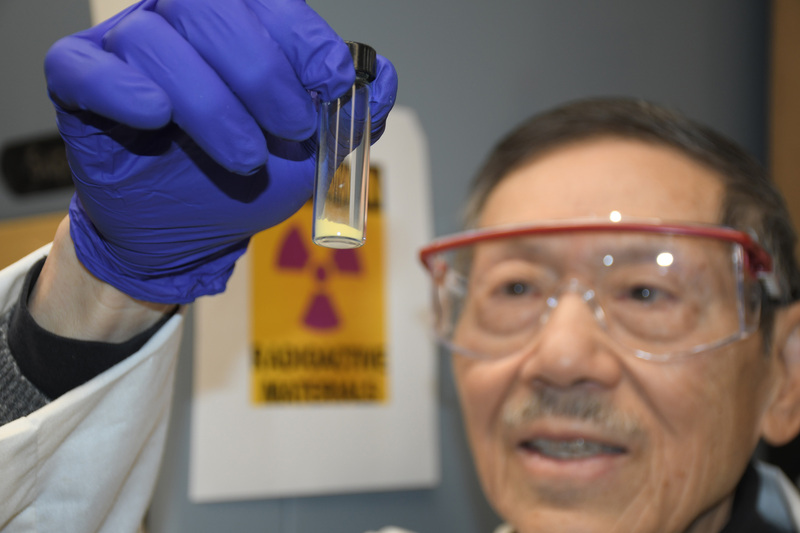 Wai is a former University of Idaho professor who, along with colleague Horng-Bin Pan, was involved in earlier DOE-funded research to develop materials in order to increase domestic availability of uranium, which is mostly imported into the U.S. currently. Wai founded LCW and, with funding from the Small Business Innovation Research program, worked out a new approach to adsorb the uranium onto a molecule or ligand that is chemically bound to the acrylic fiber. The result is a wavy looking polymer adsorbent that can be deployed in a marine environment, is durable and reusable. The adsorbent material is inexpensive, according to Wai. In fact, he said, even waste yarn can be used to create the polymer fiber. The adsorbent properties of the material are reversible, and the captured uranium is easily released to be processed into yellowcake. An analysis of the technology suggests that it could be competitive with the cost of uranium produced through land-based mining. PNNL researchers have conducted three separate tests of the adsorbent's performance to date by exposing it to large volumes of seawater from Sequim Bay next to its Marine Sciences Laboratory. The water was pumped into a tank about the size of a large hot tub. 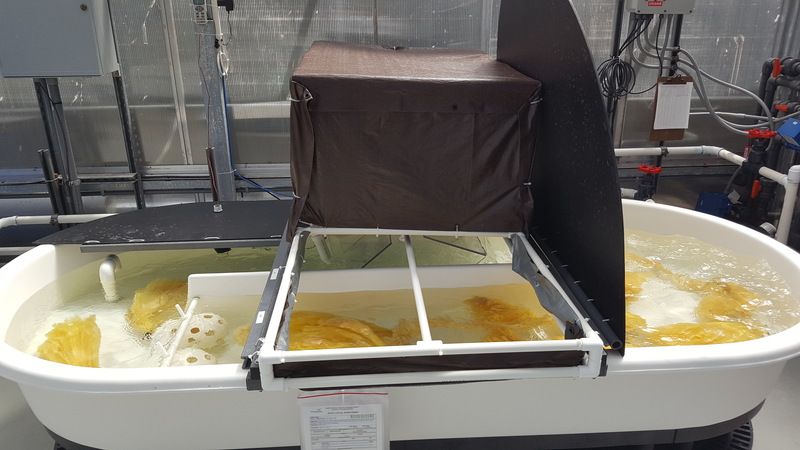 "For each test, we put about two pounds of the fiber into the tank for about one month and pumped the seawater through quickly, to mimic conditions in the open ocean" said Gill. "LCW then extracted the uranium from the adsorbent and, from these first three tests, we got about five grams — about what a nickel weighs. It might not sound like much, but it can really add up." Gill notes that seawater contains about three parts per billion of uranium. It's estimated that there is at least four billion tons of uranium in seawater, which is about 500 times the amount of uranium known to exist in land-based ores, which must be mined. Mining of underground uranium has environmental challenges not encountered with extracting it from the oceans. And Wai says the fibers, which have affinity for more heavy metals than just uranium, can likely be used one day to clean up toxic waterways themselves. He says the fibers have potential to extract vanadium, an expensive metal used in large scale batteries, from the oceans instead of mining it from the ground. 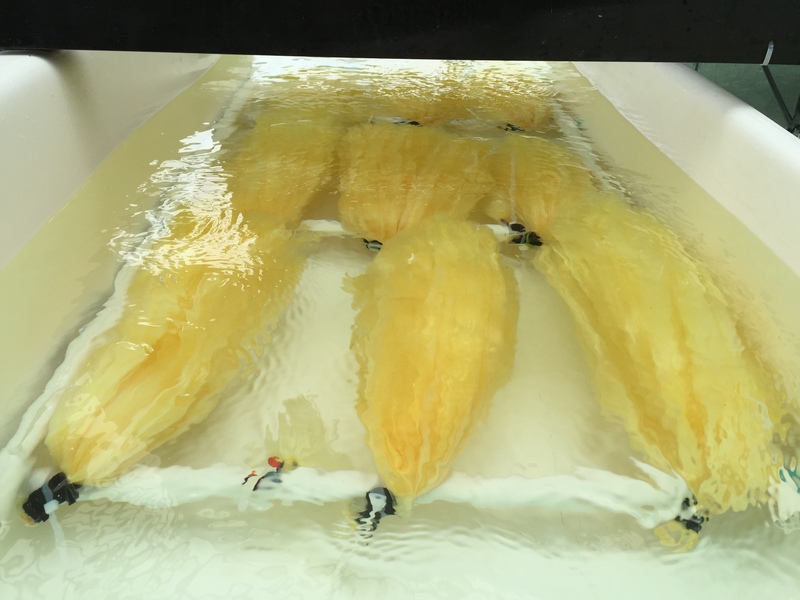 For now, based on the successful scaled-up testing in Sequim and significant production of yellowcake, LCW is applying for further SBIR funding for a uranium extraction field demonstration, to be led by PNNL, in the Gulf of Mexico, where the water is much warmer. The material performs much better in warmer water and extraction rates in the Gulf are expected to be three to five times higher, therefore making it more economical to obtain uranium from seawater. The adsorbent technology is in the process of being licensed to LCW.